It's definitely been a hot minute since I did a music post here. I don't have a legitimate excuse as music is still and will always be the biggest part of my life. It may be due to the fact that I've started vlogging for my YouTube channel more and any exciting event tends to get covered in that format. The Swet Shop Boys gig happened almost a month ago now as I hadn't initially planned on writing a blog post on it. I had contemplated vlogging it but scrapped that idea on the day due to nerves. I'm still not 100% comfortable with filming and talking to myself in public so adding that extra factor to a potentially eventful day is just an open invitation for anxiety unfortunately. So the show I'd been waiting months for came and went, and I was left with some pretty decent photos that I thought would be a shame not to share them. So here I am typing up some words to accompany them. In case you were unaware, Swet Shop Boys are a hip-hop group, one member of which I'm sure you will already know of: rapper Riz MC whose real name is Riz Ahmed and who also acts as part of his day job. Then consists of another rapper named Heems (formerly of Das Racist) and the band is rounded up with their producer and live DJ, Redinho. I must admit I originally got into their music from being a fan of Riz's acting but I've always prided myself in not having a biased bone in my body where it counts. Their album Cashmere has personally been on high rotation this year, that is until their latest EP Sufi La came out in April and in my opinion, it surpassed Cashmere in terms of catchiness which I thought was a mighty feat indeed. I'd been counting down the days till I'd get to see the boys perform, to hear their songs live as well as witness how Riz commanded a stage musically as opposed to dramatically. It was absolutely sweltering the day of the show and my friends and I decided to head to the venue earlier to hopefully get front row or at least a decent spot. I'd never been to Scala before but two of my friends saw The Pretty Reckless (Taylor Momsen's band) perform there last time and they informed me the capacity of the venue isn't that large. In hindsight I could've just turned up in the evening because strangely enough no one showed up until about 6.30pm anyway (doors were at 7pm), it would've saved me from getting sunburnt shoulders (note to self: bardot tops aren't the wisest choice of gig attire) but the plus side was that we saw Riz and Redinho arrive! 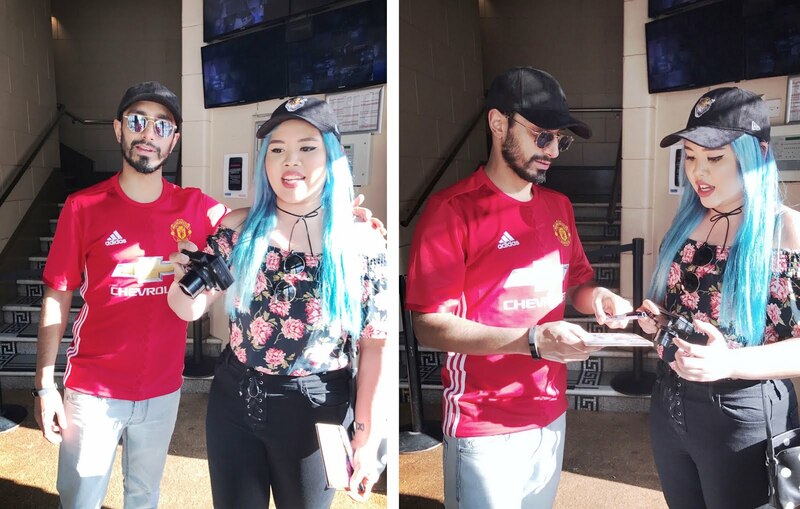 Pretty sure Riz wasn't surprised to see me there and first in line, after all this makes it the 8th time I've met him. I wasn't expecting him to rock up in a football jersey to be honest but realised further into the night that it was in tribute to the victims of the Manchester attack and then of course it all made sense because he's always so thoughtful. I should've asked him the brand of his sunglasses too (does anyone know?) because they were awesome and just so extra. Totally unrelated to the gig itself but I really want to commend the security at Scala for doing the most thorough bag and body searches before we were allowed in, they totally upended my friend's jacket and even threw out the Lemsip and Panadol pills from my bag. If you're gonna get searched, it might as well be done correctly. I have such a peeve with staff who go to the trouble of stopping you only to take a quick glance at the surface contents of your bag, what's that meant to accomplish? Anyway, rant aside, as soon as we were admitted in, my friends and I made a mad dash up the stairs whilst moaning about how unfit we were, only to rejoice when we all managed to get front row and middle in front of the stage. Admittedly it felt like forever before Swet Shop Boys took to the stage at 9:45pm (yes that's right, remember that doors opened at 7pm) and though we were treated to two opening acts (The Last Skeptik & HVAD), the audience's attention span and leg strength were starting to dwindle. When the boys finally entered it was to raucous applause and they immediately launched into Zayn Malik which is one of my personal favourite tracks off Cashmere. If Riz and Heems were fasting during Ramadan, it certainly didn't affect their energy levels as the two bounced rhymes off one another against Redinho's beats. It was almost blink and you miss him as Riz was jumping around from one side of the stage to the other at a speed to match his quickfire spitting whilst Heems' movements were more attuned to his laid-back flow. As well as performing most of their album, the boys did a short medley of the songs off Sufi La. The crowd burst into song and dance as soon as the opening notes of their hit Aaja started but then soon turned quiet (you could literally hear a pin drop) when everyone cleared the stage except for Riz and he performed Sour Times from his older solo rap work, which spoke volumes and was unfortunately more relevant than ever. At some point towards the end of the concert, Heems even came out with bananas for the audience as some people hadn't been able to break their fast before they had to enter the venue. There was no encore but they closed the show with T5 and even performed it through twice, I think that was one downside to their show—it was very short (and from hearing other's experiences, an SSB gig always is). I'm not sure why they didn't just run through each song off Sufi La instead of condensing them into a medley or perhaps they could play some of Riz or Heem's solo stuff? They did play Benny Lava which is my all-time favourite song of theirs and I was pleasantly surprised as it's an older song that didn't make it onto their album. Regardless of the running time, I had such a blast (those of you that follow me on snapchat or instagram might have seen that moment when Riz climbed off the stage and started erm, dancing right in front of my face... yeah that pretty much made my life aha) and it's a night that I still recall and replay over and over. If you've never heard of Swet Shop Boys and are in need of some new jams, I'd highly recommend checking them out for some memorable tunes. Definitely try to catch them live too, I guarantee an epic time if the prospect of spotting me at their next show is not enough teehee. Last but not least, on the off-chance that Riz himself stumbles upon this (you might be surprised at how many of my idols have admitted to reading this humble blog ahhhhh), I just wanted to say a huge thank you again, for always being the nicest and most down-to-earth person and taking the time for my friends and I. I couldn't be prouder to be your fan.